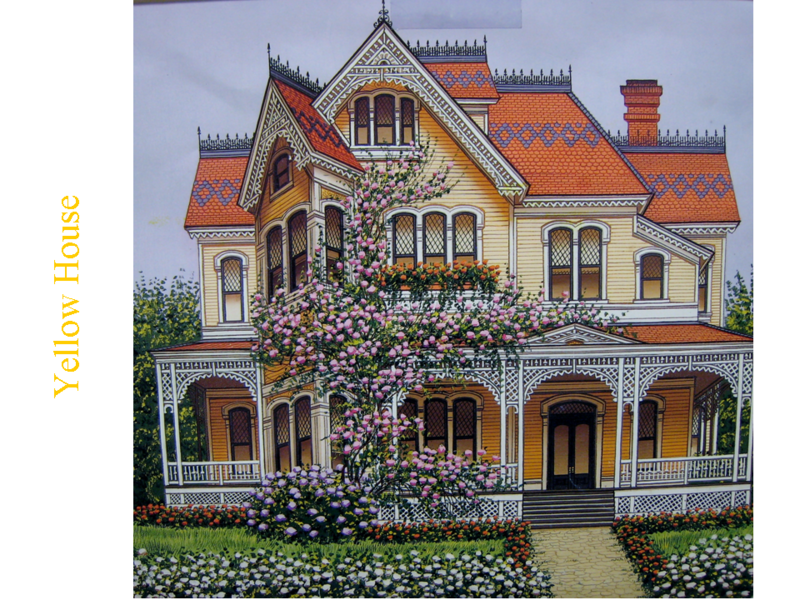 These Victorian House Paintings are filled with many different types of LINE. The raking boards, over the porches, have many curved LINES, as do the tops of many windows and many moldings. The roofs, gables and dormers of the houses illustrate examples of angled LINE. Straight, vertical and horizontal LINE can be found all over the windows in each of these houses, including the steps and fences. Don’t forget the PATTERN found in the bricks, siding and shingles. The COLOR of the foliage creates an atmosphere in these pictures. The COLOR used in the landscape of Houses #5, #6 and #7 tells the viewer what the season is. WARM COLOR is used for autumn leaves. 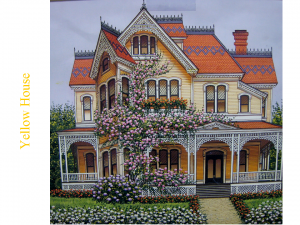 Ask the class: Does the COLOR of a house affect how you like or dislike a picture? Very often we are attracted to pictures with the COLOR we like. Because the FOCAL POINT, or subject, of each painting fills the picture, and the subject of every painting in this Packet is a house, COLOR will have a more powerful effect on the preferences of the viewer than it usually might. The architectural details of the houses should be discussed with ALL grades. Grades K-2 need only identify differences in windows, Gable, Balcony, Porch, and maybe Iron Cresting and Tower. An easy way to do this is to hand out copies of the glossary page to each student before you begin the presentation. What is Architecture? It is the art of designing and building structures. Architecture is more than just buildings. Any structure that is planned and built by people is an example of architecture—buildings bridges, tunnels, roads, parks, gardens, even plans for entire cities. What is an Architect? An Architect is an artist who designs structures (buildings, bridges, tunnels, roads, parks, and cities). An Architect designs the outside and inside plans of a building. These artists have put as much energy, skill and pride into their work as a painter would put into his painting, or a sculptor would put into a statue. ° Why was it built? ° Does it seem to fit the needs of its users? ° Are its users happy with it? Architecture is everywhere people are. For instance, you might not think that a circus involves architecture, but its design has been very carefully thought out and it has an architecture all its own. Its designers know they must create tents that can stand up to rain and high winds. The tents must be easy to put up and take down. They must be able to be stored in a small space. A circus building must also be colorful and fun. It should create a festive atmosphere. Architecture looks different in various parts of our country and the world. Architects and builders use the material that is most available around them. For example, here in the Northwest we mostly use wood, because we have many trees. Buildings have clues to tell us why they were built. Places for living often have fences, tall plants or walls around them to give people privacy. Places of worship provide a space to get away from everyday concerns and worries—visitors are inspired by the beauty of stained-glass windows and comforted by the quiet and solitude. Big stores, like the ones in downtown Portland around Pioneer Square, (Meir & Frank and Nordstrom) are designed with big windows, to lure passers-by to come in and shop. There are buildings built for learning (schools, universities), work (offices, factories), and places to have fun (theaters, skating rinks, coliseums, stadiums). A structure’s style tells us something about who its creators were, when it was built, and why. These homes are created with much detailed, or “gingerbread”, decoration. After viewing a picture from this Packet, ask the class to describe some of the decoration they see on that Victorian house. 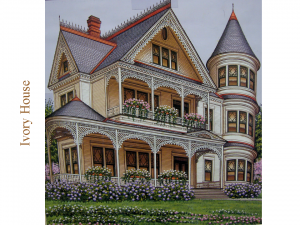 (May include iron work, shingle styles, window decorations, window shapes, porches, trim) Why do you think the word “gingerbread” is used to describe these houses? Give the class a hint with the next question: What do you usually do with a gingerbread cookie or a gingerbread house? You decorate them with lots of detail and that is just what the architects and builders did with Victorian houses. The term “Victorian” is used to describe the attitudes of people during the times of the English Queen, Victoria’s reign. The title of this architectural style honors Queen Victoria. Queen Victoria ascended the British throne in 1837 and was extremely popular during the 63 years of her reign. Although this style of home originated before 1837, when Victoria took the throne, the style remained popular throughout her reign. 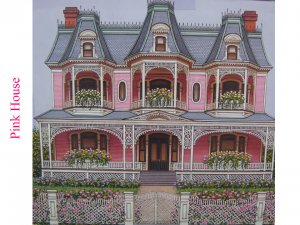 Victorian architecture is considered a romantic (creative, colorful, magnificent) form of architecture. In the mid-Victorian Era (1840’s and 1850’s) Americans became more adventurous in their building styles. They began to “Americanize” the style. During this time the Mansard roof line appeared. This roof line is usually broken by Gables. Centered in the gable is generally a window that is often very different from the windows in the floors below. Dormers were often used, along with some type of decoration. The practice of using Brackets along the roof line, to add detail and decoration, also began during this time. The doors and windows were arranged as SYMMETRICALLY as possible. Victorian homes usually had a covered Entry Porch, where families could sit on cool summer evenings. Many Victorians had two-story Bay Windows. Larger windows were made with smaller pieces of glass (often colored glass) pieced together with leading, around the edges of a fairly large piece of glass. This allowed the windows to appear larger than the sheets of window glass available at the time. 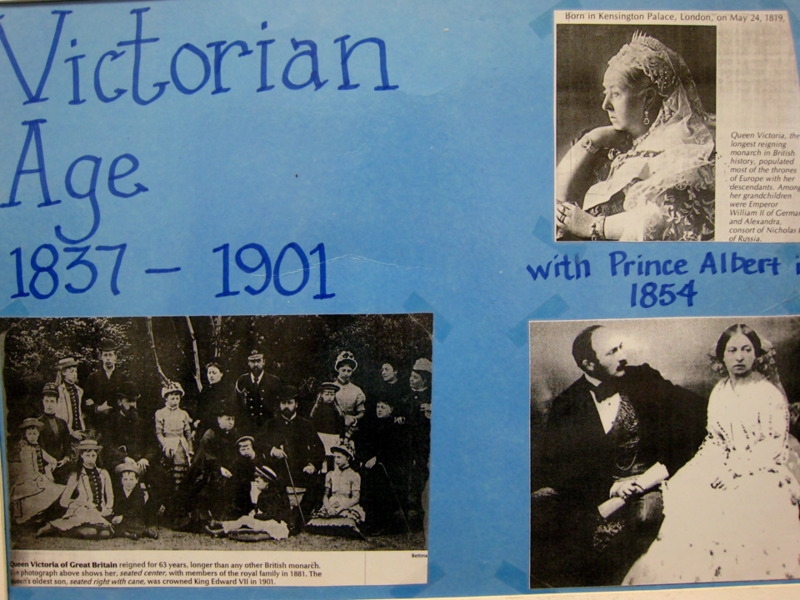 The late Victorian Era began in the middle 1880’s. 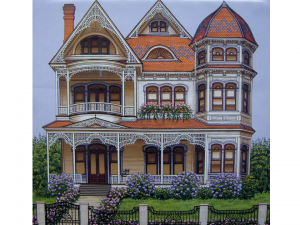 The adventurous spirit in America, during this time, can be seen in the “Queen Anne” style of Victorian home. This was a very popular style in America and appeared in small towns, farms and large cities. Victorian houses always had a wide Front Porch or wrap around Verandah (featured in #2 Ivory House and #7 Lavender House). These houses had irregular roof lines and floor plans. The main entrance was usually off-center. The windows during this era were often paired, or they had smaller side windows next to them. Larger glass panes were available at this time, so not every window was made of the many small leaded pieces, as had been done earlier. Although Victorian houses were wood framed, many other building materials were used to build them. Iron Cresting very often decorated the top of the Roofs, Towers, Turrets, Balconies and Gables. Patterned or colored glass was very popular. There were always very tall Brick Chimneys, which usually widened at the top. Towers, turrets, balconies and bay windows gave Victorian houses many interesting nooks and crannies, instead of being square and boxy. The basic Victorian building was always decorated with “gingerbread” trim called Fretwork. To fret means to worry over something and the details of fretwork took a lot of work, time and effort, so they may have given somebody a lot of worry. There were as many styles of Victorian fretwork and decoration as there were carpenters to create it. This made each house a unique creation. Fretwork was seen in the fancy wood trim between the posts on porches, called a Spandrel. Along the roof line of a gable, more fretwork can be seen, called Raking Boards. Most of the doors and windows have a molding above them. These were either Drip Molds or Hoods (small jutting eaves). Another type of popular decoration was an Eyebrow Dormer. Victorian interiors included many popular details of the time. Some of these were wood paneling, floral wallpapers, pottery tiles, parquet (pronounced par-kay: patterned wood) flooring and marble flooring, wainscoting, ornamental plasterwork, ornate bronze (shiny) hardware and fixtures, paintings on ceilings, dark wood furniture, velvets and other richly colored fabrics. Compared to the sleek and organized look preferred in homes today, Victorian interiors were filled with so much detailed decoration and ornamentation that they might seem cluttered. Popular Architectural styles for homes of the 1960’s and 1970’s—If you look at the subdivisions of Vancouver, built mostly in the 1960’s and ‘70’s, you might notice that Ranch style houses were very popular. This type of home was built on one level and sometimes had a basement. They are usually rectangular, with the garage attached to the house. Some ranch houses have a garage that extends forward, just a little from the front of the house. Some have garages or carports built separately. Split-Level style houses became popular, beginning in the late 1960’s. Most houses built in this style are very similar to a ranch, except with two stories. The entrance usually opens to a landing, with a staircase that goes up to the main part of the house and a staircase down to a basement. The upper level resembles a basic ranch house layout. The lower level usually has a connected garage, under the main living area, a large main room and smaller rooms, such as a bedroom and/or a laundry room. Who lives in a “Ranch” style home? Who lives in a Split-Level home? Encourage kids to go home and ask their parents what style of home they live in. 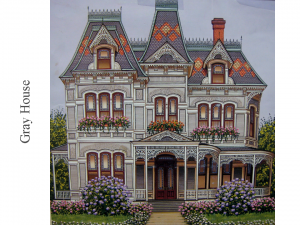 Grades 3-5: Pass out copies of “Glossary of Architectural Elements of a Victorian Style House”. (There should be a folder containing laminated, two-sided copies of this page. You are free to let the class use these, but it is IMPORTANT to return them to the folder when you are finished, so that other classes may also use them in their discussions.) The class will refer to this sheet in discussing the pictures. As you hold up each picture, ask the class if they can find any of the elements described in the glossary. For the first one or two pictures, you may need to list a couple of the elements for them (and point them out), so that the kids will understand what you are asking. While Sue wall was in college, at Ohio University, between 1968 and 1972, she began going out and sketching abandoned stores and derelict houses. Sue knew that this was the style of art she wanted to pursue, and she did it well. Just one year before Sue earned her Master’s Degree in Fine arts, she was invited to do a one-woman show in New York City. By 1993, Sue had done more than 35 one-woman shows and more than 200 group shows. Her art was completely sold out at all of these shows. Sue keeps her prices on her art works reasonable, so that anyone who appreciates her art can afford to buy it. Traveling to all of her shows gets Sue out of the studio to collect fresh ideas for her paintings. Today she also sells her paintings on the internet. 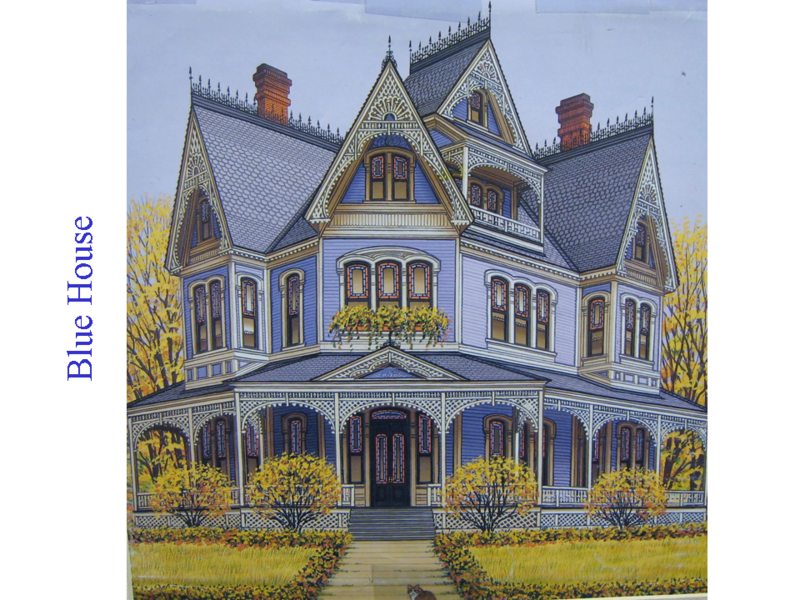 None of Sue Wall’s Victorian houses are real. They are composites of other houses she has seen and ideas of her own. Her paintings are created with acrylic paints, on canvas. Sue Wall loves cats. At the times these houses were painted, she had five of them. See if you can find any of Sue’s cats in some of her paintings! Point out that the artist has used many bushes, flowers, plants and trees in her artwork. How does landscaping affect the way a home looks? Point out that Sue Wall has painted make believe houses. 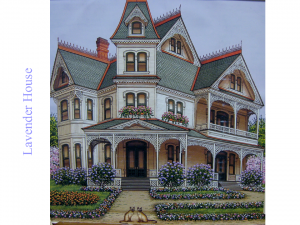 These houses are based on ideas she took from observing real Victorian homes, but the homes she painted don’t really exist. 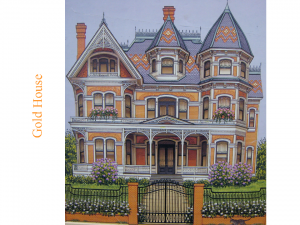 Two great resource books you could check out of the Library, with beautiful photographs of real Victorian Homes, are Painted Ladiesand More Painted Ladies. A requirement for homes featured in these books is that they be painted with at least three different colors. The author believes that is the only way to really bring out the varied details of Victorian architecture. Ask if anyone has ever seen a real Victorian home. Many newer homes have borrowed features normally found on old Victorian homes. Older sections of towns or cities may still have Victorians. There are some Victorian homes in downtown Vancouver, downtown Portland, and Portland’s West Hills. The Dalles, Oregon has a city park that features a Victorian Gingerbread House. There are other nice Victorians in The Dalles also. “The Slocum House”, in downtown Vancouver’s Esther Short Park, is another nice Victorian to see. Encourage the class to take their families on a drive to look at some of these interesting homes. Maybe you could take a ride yourself and snap a few photos to bring into class and spark their interest. One thing we notice about the taste of the artist is that she prefers white trim work on Victorian houses. 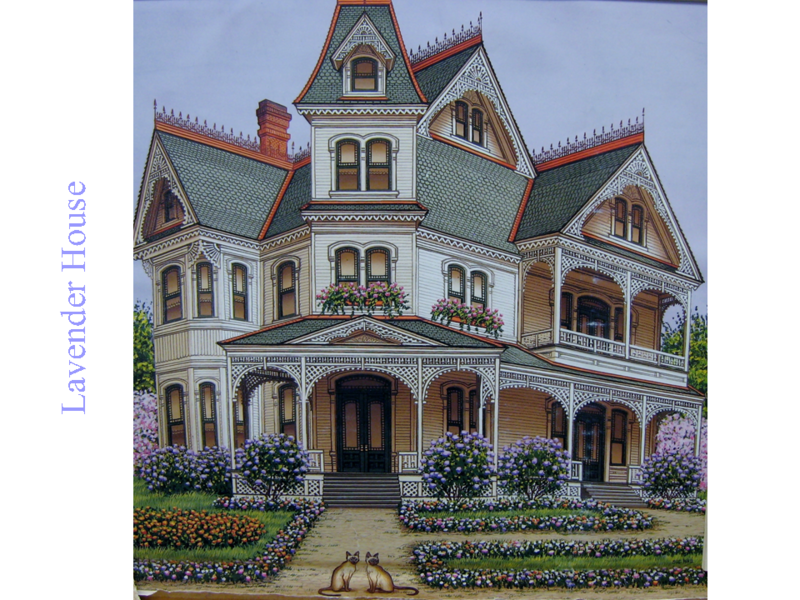 Many Victorian houses have trim work that is painted in several colors. Compare the front doors of the houses. How many doors have windows on or beside the door? Compare other details between the houses such as windows, landscaping, rooflines, fretwork and chimneys. 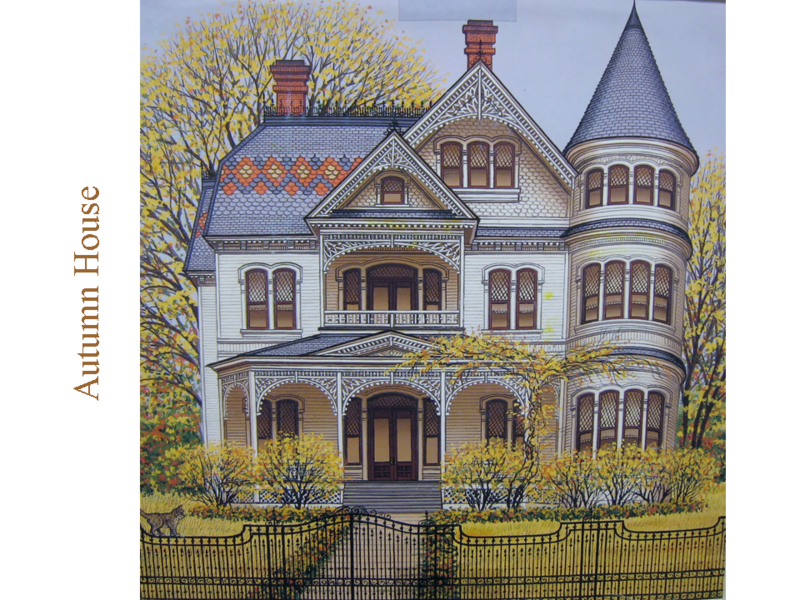 Have younger students draw or paint a picture of their own home. If they have a cat or a dog, encourage them to draw it outside of their house. Give older students graph paper and have them design a floor layout of their “dream home”. You might give them two pieces of graph paper, to draw a second story. Discuss ideas a dream home might have—indoor swimming pool, elevator, escalator, exterior of a castle, airplane hanger, twelve car garage, golf course, bowling alley, etc. Use catalogues and magazines to have the class cut out furnishing for a house of their own. Have them draw a living room and glue the furnishings into it. Draw flowery Victorian wallpaper on the walls. Cut out a family to live in the house. 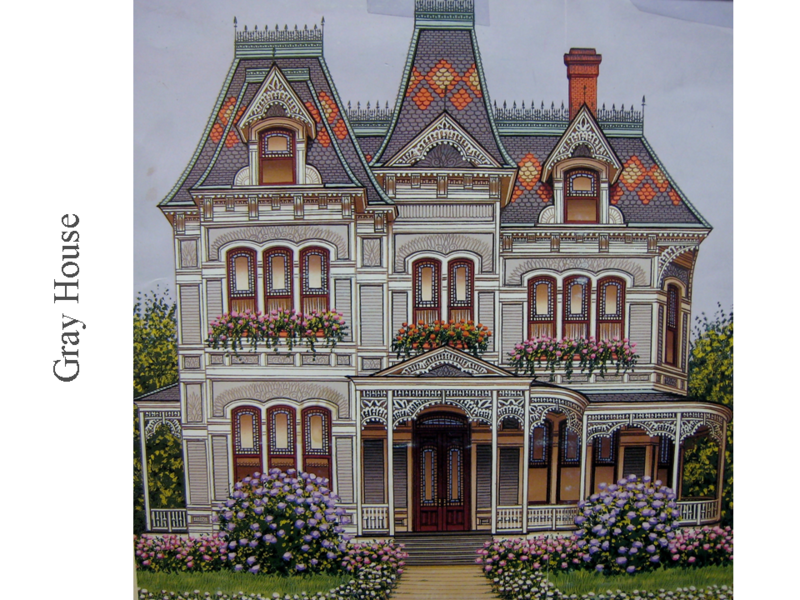 Create a 3-dimensional Victorian house with a milk carton. Cover the main part of the house with construction paper. Triangles with fretwork drawn on them could be glued to the “gables”, at the top of the carton. A rectangle of black paper could be folded in half, over the top of the carton, and taped or glued on for a roof. Windows and doors should be cut from contrasting paper and glued on. Create a classroom neighborhood of milk carton houses. Send a note home ahead of time to have kids bring in a small photo of their family or one of their wallet sized school photos. 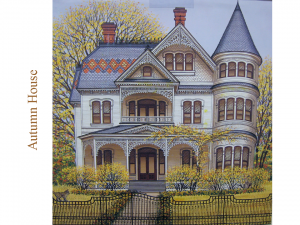 The class could draw houses on poster or tag board and decorate them with fretwork, iron cresting, gables, etc. These could be painted or drawn on. Create a window that is cut out the right size to display the photo. This house will make great gifts for parents or grandparents. Trace the finished house on another sheet of poster board, or construction paper, and glue this to the back for a finished look. Use the coloring page to do the above project. Glue it to tag board, poster board, or construction paper, with a window cut out for the picture. Forget about the house part of the paintings and concentrate on the floral paintings. Pay attention to the different colors, designs and patterns the artist uses in each of these pictures. Sue Wall paints in a FOLK ART style to create her flowers and plants. She concentrates on their uniform SHAPE, rather then trying to make the flowers look realistic. Using small pieces of sponge, create a green bush or bushes. Don’t dab the sponge marks too closely together, so that you will have space to paint the flowers. Try using two shades of green or green and yellow. This will give the bush more dimension. To make the flowers, dip the end of a cotton swab into paint and dab it on the bush. Don’t make more than two flowers before you dip the swab back into the paint. If you dip the swab after each flower, the flowers will be more uniform in size. Paint a climbing rosebush vine (study #5 Yellow House). Use brown or green fine tip felt pens to create the climbing vines. Notice how there are many vines in this painting. Create alternating green leaves along the vines, using the tip of a toothpick, dipped in green paint. Use two shades of green. You can mix a little yellow with some of thee green to create a lighter tint. Notice how the tips of the vines have just tiny dots of green. Make roses with the end of a cotton swab. Notice how the roses have a darker color at the bottom and a lighter color on top. To create this effect, dot all of these with the darker color first. Blend a little white with the darker color to create a more pastel color. Dab this on top of the darker color, leaving a little of the darker showing at what would be the flower base. Flowers always point to the sun, so be sure to notice where the top of the flowers should be, as you are painting. Another pretty effect is to add a tiny dot of the darker color to the tip of the lighter shade with a toothpick. This gives these folk style roses more dimension. If it is fall when your school receives this packet, you may want to create some fall trees or bushes, like Sue Wall did for #7 Autumn House. Use blue or gray construction paper and paint a brown tree with bare limbs. After the paint dries, sponge small dabs of WARM COLOR (yellow, orange, red) on the limbs and the ground below the tree. FORMAL (SYMMETRICAL) BALANCE: An identical design on each side of a space, divided in the center by an imaginary center line. The design on one side is a mirror image (or almost a mirror image) of the design on the other. Both sides are equal. A face is a good example of a mirror image. Each side has eyebrow, eye, nostril, etc. if you are viewing the face from the front. In art, FORMAL BALANCE (also called SYMMETRICAL BALANCE) doesn’t happen as often as INFORMAL or ASYMMETRICAL BALANCE (different on each side but equal). Unless it is a portrait, it is very hard to create an exact mirrored image, so usually an example of SYMMETRICAL BALANCE in art is almost an exact copy of the other side of a picture. Point out the way the artist has symmetrically arranged this house. Even the landscaping is symmetrical. Divide the house with a piece of yarn. 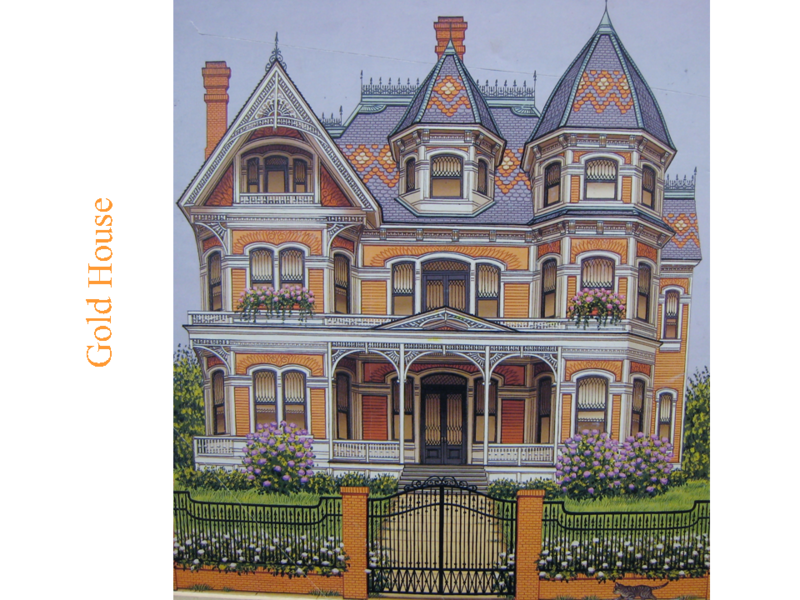 This house is symmetrical because it has the same architectural and landscaping elements on each side of the yarn. Even the lattice fence and gate (in the FOREGROUND) are the same on each side of the painting. The artist also painted the exact arrangement of flowers on either side. INFORMAL (ASYMMETRICAL) BALANCE: A DIFFERENT design on each side of a space, divided in the center by an imaginary center line. Both sides are equal but different. Every other house in this packet has INFORMAL, or asymmetrical, BALANCE. Explain that the PATTERN of small squares that frame the window glass on this house are smaller pieces of glass that have been attached to the larger piece of glass by soldering with hot lead (the black outlines), which acts like a glue to join the glass pieces. At first, this was mostly done to create a larger pane of glass, to let more light in. Earlier Victorians were built when there was a limited size to the availability of glass. To enlarge the light source, decorative pieces of glass (sometimes colored) were soldered to create beautiful PATTERNS in the windows. Notice the colored (orange and yellow) diamond PATTERN in the shingles, along the mansard roof. This painting features one of Sue wall’s cats in the FOREGROUND (walking along the front of the fence). Notice the colored (orange and yellow) diamond PATTERN in the shingles, along the roof and the dormers. Notice that the roof shingles on the tower (or the turret, we can’t tell for sure) and above the dormer only have the colored PATTERN on the front section. Notice the leaded glass window and door PATTERNS. This house has the most unusual angles. Notice the sharp angle on the left side of the house. The house isn’t built in a rectangle, the way most of the houses were. There is a climbing rose bush that takes over a large section of the building. There are two covered porches on this house. Notice the blue diamond PATTERN of the roof shingles. The base of the front and side porch is covered with lattice (at the foundation). What season of the year does it display in this painting? The roses give us a clue that it may summer because roses begin blooming early in the summer. What did the artist do to give us a clue to the season she painted this house in? The grass, the bushes in front of the house and the vine climbing the porch are all painted yellow. The trees behind the house have yellow leaves and, if you look close, you will also see dabs of orange. This house features a diamond PATTERN in the roof tiles of yellow, orange and a darker shade of blue. This painting also features another of Sue wall’s cats, walking along the top of the wrought iron railing, in the FOREGROUND. Notice the cat in the FOREGROUND, in front of the sidewalk. This house has lattice all along the foundation. What do you notice about the leaded glass around the edges of the windows? It is colored orange and lavender. Compare these leaded windows with the other leaded glass windows (3. Gray, 4. Gold, 6. Autumn). Do you see a difference in their COLOR or PATTERN? What season is it? How can you tell? William Morris (1834-1896) was a British designer, writer and printer who led the Arts and Crafts movement. Morris and the other Arts and Crafts designers promoted work that looked handmade and used examples from nature, like plants and birds. These artists designed interior furnishings such as wallpapers, fabrics, carpets and stained glass in a distinctive, flowing style, like the one shown here for you to color. This design for a Victorian stained glass window was produced by Morris And Company. The Arts and Crafts Style called for using soft, natural colors. Which colors will you choose for this Morris design? This flat, two-dimensional drawing can be made into a three-dimensional structure. Cut, fold, glue, and presto…you have created a model of a house! Copy the pattern and create an entire neighborhood! 1. Carefully CUT out the house along the solid outline. 2. Carefully CUT solid lines inside the two windows, as shown below. CUT the two solid vertical lines, below the front door (above bottom rectangle). 3. FOLD back the two flaps of each large window that you cut above. Later you can peek inside your house, through these windows. FOLD rectangle strip, along the broken lines, fan or accordion style. This will form the steps of your house. 4. COLOR and decorate the outside of the house with crayons or colored pencils. DON’T USE MARKERS! Decorate the Gables of your house with Raking Boards. You might add scalloped siding shingles. Create a Stained Glass pattern in the two windows above the front door, or in the door ovals (depending on your preference). 5. Turn the house over to decorate the two rooms on the inside. Try creating the upstairs room like your bedroom and the downstairs room like your living or family room. Add details such as a couch, TV, computer, bed, bookcase, lamps, or plants. 6. Now, FOLD along all other broken lines and glue the flap along the side of the house, where indicated. Your house should now begin to take shape! Next, glue the three flaps at the bottom together, to form a base. 7. Assemble the roof by gluing the tabs where indicated and pressing together. Peek inside the windows you cut earlier to see who lives inside! For 20 years Charles Dana Gibson (1867-1944) was one of the most popular illustrators this country ever produced. His work appeared in early Life, Scribner’s, Harper’s, The Century, and Collier’s magazines, once earning a record $50,000 for 52 drawings in Collier’s. Gibson’s immortal “American girl” (remembered now as the Gibson Girl) became the dream of American femininity, and her immense popularity foreshadowed that of movie stars. Gibson’s Girls chronicle the gilded Victorian age!